Mark Hunter is the latest interviewee for the rowers’ roots series I’ve been writing for Rowing & Regatta magazine. As always, there were plenty more words available after the interview – at Poplar Blackwell & District RC back in March – than a magazine feature will allow. Here are a few more from the Thames waterman who went from finishing 13th on his Olympic debut in Athens to becoming the first British lightweight rower to win Olympic gold, with Zac Purchase in the double in Beijing. The interview was arranged through British Airways, the official airline of the London 2012 Olympic and Paralympic Games, which supports Mark by flying him around the world. “I didn’t have my wellie boots when I first came down, I had some trainers. They got covered in mud because you had to wade in so I learnt a lesson straight away. “Out on the water you’ve got to deal with pleasure craft, waves and the tide so you grow up very quickly on your watermanship and knowing where you need to be and what you need to do. “When I was doing Henley with the Windsor boys [a composite that won the Fawley Cup when he was 18] they came down and we all went out in our singles. I’ll never forget, paddling back from the Tower of London, a ship came past and they froze, wouldn’t move, didn’t know what to do. I just started laughing and sculled away. “It’s not somewhere most internationals would come to because everyone’s up at Henley and the glamour part of the sport. Here it’s old school. There’s nothing glamorous in training down here. “It was frustrating. You’d be in the middle of a piece and [the river bus would] go flying past and I’d be soaked. But that’s where you learn your skills and grow up very quickly. It’s not beautiful out there, it’s going to be challenging. When it comes to racing in rough water, that’s what you thrive on. “He introduced me like he did any sport. He’s opened so many doors for me in trying different sports but this was a sport he’s passionate about and it’s the one I fell in love with. “When I was at school no one else knew what rowing was so that was something unique for me. “I dabbled in football but knew I wasn’t going to be a pro at that. I did swimming and knew I wasn’t the right size and shape to be good at that. Rowing was ideal. “I went to Peterborough Regatta. It was the first time I’d raced on a multilane course. I went in not having any expectation as a J14 but ended up winning in a course record for that event. “He’s brilliant at bringing kids on, developing them and getting the best out of them while they’re juniors. “What I loved about him was that he said, ‘You’re moving on now,’ rather than trying to keep me to himself, which is where a lot of youth coaches go wrong; they don’t let talent blossom. “It’s special but you’re with them 24 hours a day so it can be intense, and there comes a point where you have to let them go. “At 23, he turned to me and said, ‘Other coaches tell me the same thing but I listen to them and I want to argue with you,’ so I said it was time to move on. “When I was a junior it was more apparent. When you go to junior training camps there’s Eton boys, Radley boys; they’re from a very different environment to you. But most of them haven’t got any banter so you can make them look stupid. “People said I should try lightweight but I wanted to try and make it as a heavyweight. Unless you’re a natural lightweight its quite dangerous to try too early and also it affects your life outside rowing. I was quite happy to keep developing and enjoying life. “After the Sydney Olympics, I decided to go lightweight. I’d finished at Under-23 and I gave myself two years to make it as a lightweight. I went straight in to the team within a couple of months but it was challenging to learn how to lose weight, how to perform. Some of the things I did then I would never do now – the amount of running I did was insane. “I wanted to prove to myself as well as everybody else that it could be done and that I was better than being 13th for the Olympic Games. I think that’s why people enjoy listening to it because it shows you can be at the bottom and turn it around. “It doesn’t matter what part of life you’re in, whether you’re in a business that’s struggling, doing the right things and looking to improve in certain areas, it’s the same as an athlete, looking to get to the top and looking to get better. “Even when I was getting knockbacks and it wasn’t going well, I knew I had to work harder and just be a better athlete; that would carry me, I’d find somebody else and then it would work. “I wanted to succeed, I had to succeed. “I learnt an awful lot. I’d coached part-time before but to be in charge of a group properly for a whole year was massive. To tell an athlete, ‘You’re not going to be in a crew in this one,’ was so hard. But with the experience I had I knew the things that were going on in their heads so I could jump on them and say, ‘I know you’re thinking this,’ and they respected that. “I loved that opportunity to give something back and teach. I love coaching and maybe afterwards that would be a great thing for me to stick and get to the top of. Last week in a charity auction, a single seat on a launch following this year’s Boat Race was sold at auction for £500. By that mark, I’ve had few thousand pounds-worth over the last few years but this time I will be on dry land for the annual joust between Oxford and Cambridge. Maybe it isn’t as historic as the first radio broadcast of the race in 1926, or the first live TV in 1938 – in part because others have done it before – but this year’s live text commentary on the official race website will hopefully be pretty special. Reporters Libby Richards and Oscar Schonfeld will be on Twitter throughout Tideway week (contributing respectively to the @CUBCSquad and @OUBCSquad feeds) and will be my eyes and ears around the Putney Embankment on Saturday, while I’m based in front of a large plasma screen at the Mortlake Boat House, where the crews will end up. And I hope we will get some good input not only from the 250,000 pairs of eyes lining the course for the race but also the seven million or so watching on TV, who will be able to send comments via the live console or get in touch on Twitter using the hashtag #theboatrace. Perhaps unlike text commentaries of a decade ago, this isn’t just for people unable to watch or listen elsewhere; it should be a perfect complement on a laptop or mobile, whether as a “second screen” for TV viewers or a useful guide for those on the towpath as to what is going on further along the course. And it will also be about the entire day, from the moment the crews arrive in Putney at 1130 BST, through the race at 1415 and reaction afterwards, going on until 1530. The live text page is already available so please bookmark now and join in on Saturday. I got a chance to visit the Oxford squad in Wallingford during training a few weeks ago, and put this video together for the West London Sport website. Fleming Boathouse is like nothing I’ve seen outside the GB HQ in Caversham, near Reading. In fact it’s far prettier than Caversham, which is where the Great Britain team on Wednesday will reveal their line-ups for the first World Cup of the year, in what is likely to be an almost-finished draft of the Olympic crews. There are lots of rumours flying, the obvious one being that Pete Reed and Andy Hodge have moved into the men’s four but also suggestions Alan Campbell has given up on the idea of competing in the double scull and will stay in his single. All will be revealed on Wednesday but in the meantime it’s worth having a look at The Squad, a web series commissioned by British Rowing to introduce all of Great Britain’s to a wider audience. The GB squad system in place now would have been completely foreign to national crews in the 1960s, but then (aside from a single medal won in 1964 by a four including Campbell’s coach Bill Barry) so was Olympic success between 1948 and 1972. That was when GB’s Czech coach brought the country’s top rowers together and won the Olympic medals that marked the beginning of Great Britain’s rise to being one of the world’s top rowing nations. I was engrossed last week in “Pieces of Eight: Bob Janousek and his Olympians” the new book by Chris Dodd (who I work with on the Rowing Voice online magazine). Look around on Tideway week and you’re likely to see a few of the characters from the Janousek years still lurking (as well as plenty of boats built by Bob after he gave up coaching). Westminster schoolboys might enjoy the tale of their head coach Bill Mason being ordered to have a haircut by the GB team manager, John Tillbury, while part of the Thames Tradesmen “Beatle Four” in 1973. One morning Tillbury caught the tradesmen crew coming in a 830am and asked them where they had been. Actually they had been for an early morning paddle on the best water at the best time of day – a practice unknown to the British team until then. Tillbury went mad and pulled them up before the management. There will be more from Chris, more on the Boat Race and more on the Great Britain squad announcement in the next issue of Rowing Voice, which is out at the end of the week. Oh, and the new Rowing & Regatta magazine is out this week, featuring an interview with Annabel Vernon – the only Women’s Boat Race blue in the Great Britain squad – about her rowing roots. 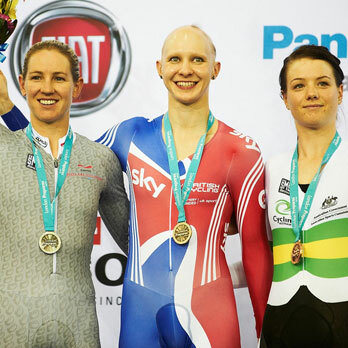 After watching Joanna Rowsell win two World Cup golds over the weekend at a frenzied Olympic velodrome, I had the chance to chat to her on Monday for an article on the West London sport website. She talked quite a bit about how good the inclusion of the women’s team pursuit in the Olympic programme has been for women’s cycling in general, requiring each nation to focus on strength in depth as they need three riders of the highest standard. And she said she would like to see a female version of Team Sky in future, giving the Great Britain women’s squad the sort of support many of their male equivalents receive. Australia’s GreenEDGE team has been set up along the same lines of Team Sky, with a squad including many of the nation’s top track riders, aiming to improve Olympic chances. But it also has a women’s team, who have already had some success this season. Meanwhile – as you may have read in this blog in December – Great Britain’s top women have to find their own trade teams, and deal with disruption and uncertainty as the women’s circuit is nothing like as secure as the men’s. Rowsell had a chance to see close-up how Team Sky works when the GB women shared their training camp in Mallorca earlier this year, and got to share their facilities, including a chef who travels with the team. Although their focus this year will mainly be on the track, the pursuit team also train and race on the road racing to increase endurance. Rowsell and Dani King both compete for the Matrix Fitness – Prendas team, which provides equipment and expenses, not the sort of sizeable contract their male counterparts enjoy with Sky. Rowsell named a list of British road riders who would benefit from being on such a team, including Olympic road race hopeful Lizzie Armitstead, Beijing time trial silver medallist Emma Pooley and youngsters Katie Colclough and Lucy Martin. “It would be great to have a British team, then maybe the team pursuit riders could join them when the programme suits them,” she added. There are suggestions the Halford’s Tour Series – a circuit of town-centre criterium events – will include four women’s races this year, which is likely to mean another chance to see Rowsell in action on home soil before she goes for gold in London. In the meantime, you can find out more about her – and download a sponsorship proposal package – on her personal website. There were hints here and there over the last few days but for many, the news that the Women’s Boat Race between Oxford and Cambridge will gain parity with the men’s event in 2015 came as a shock when Rachel Quarrell’s story was published in the Telegraph on Wednesday morning. Women were admitted to membership of the MCC in 1999, while Wimbledon granted equal prize money to men and women in 2007. This is another major milestone for equality in sport. From 2015, the women’s race will be run on the same day over the same course, moving from its current place at Henley-on-Thames, usually the weekend before the men’s event. New funding from asset management company BNY Mellon and its subsidiary Newton – under a five-year agreement – will bring equal funding to men and women from this year, without reducing the amount the men’s squads currently receive under the deal with Xchanging that expires this year. The three-year delay is to allow for an improvement in infrastructure and performance levels for the women’s boat clubs and to iron out logistical issues such as who boats from where, who races when and how the media gets to watch both. The men’s reserve race will remain as part of a triple bill but the women’s reserve race and the men’s and women’s lightweight events will remain in Henley. The BBC has committed to covering the races equally, although a contract has not yet been sealed with the broadcaster past 2014. There are more questions and answers in this Rowing Voice blog, written by Rachel and me and in this article on the West London Sport site. Sir Matt expanded on this, and named two women – Anna Watkins and Natalie Redgrave – who could have featured more heavily in the Women’s Boat Race had parity been achieved earlier, in my blog entry for Hear the Boat Sing. Here is a pick of the reaction on Twitter. So far, no one has raised a single objection. The main sentiment seems to be that it is amazing the change did not happen sooner. Fantastic morning for the Boat Race. New sponsor in BNY Mellon and the Newton women's event moves to London. On and up for both races. “@martingough22: Women’s Boat Race set to be given equal billing with the men’s, says RQ in the Telegraph http://t.co/3iIdktDG” About time! Now that we're allowed to break radio silence; congratulations to @OUWBC and @CUWBC. Historic day. All the best for the future. Thrilled about @theboatrace news. Looking forward to seeing a viable pathway from @cuwbc and @OUWBC to @britishrowing re-established. Yay! Just when you think no one's listening re. equality in sport, something good happens: http://t.co/ROHlDAPv Hooray! The para-cycling track World Championships get under way in Los Angeles on Thursday and more of the interviews the team gave me at their media day in Newport will be online this week as the 14-strong squad look to improve on the nine gold medals they won last year. Obviously, Butterworth’s is a frightening story but I found this interview intriguing more because of his matter-of-fact approach and attention to detail – two factors that his coach Chris Furber believes are a major factor in his success. 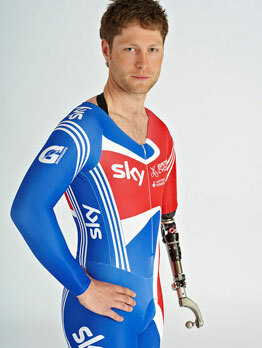 Furber said: “He’s highly analytical and that fits brilliantly with track cycling because it’s a highly analytical sport. It’s about numbers and drag and laps and splits and times. He thrives in that environment where I’m giving him constant factual number feedback. “He’s also a little bit of a dreamer who believes in himself and I think you need that as well because you need to be able to look at world bests and think: I can make that, I can beat that. My feature on the “wild world of tandem racing” is also on the Channel 4 site as is an interview with Jody Cundy on how he stays motivated despite having won so many world and Paralympic titles. The official website for the 2012 Worlds has live video coverage each day, a schedule and a page for results. The British Cycling Twitter feed reports the latest news from LA and you can catch up with the latest by searching on Twitter for #ParaTrackWorlds. Last Friday brought the first media day of the year for the Great Britain rowing team, exactly six months out from the start of London 2012. The buzz was reflected by the 106 journalists in attendance. As one regular attendee said, “Do you remember when it was three of us and a dog?” The answer is probably more recently than you think. Profile of Katherine Grainger for Rowing & Regatta magazine. In a 35-minute interview, filmed by the British Rowing website, Katherine talked about her route from reluctant rower to six-time world champion, and how she almost took up juggling instead of rowing. The magazine is out at the beginning of March. 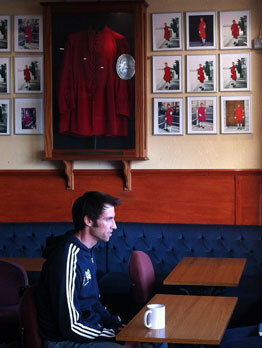 Interview with Greg Searle for the first 2012 issue of Rowing Voice, which is due out in the second week of February. I also spoke to Garry Herbert – the BBC commentator who coxed Greg to gold in 1992 – for a column in Voice. Rachel Quarrell and I published a blog on Sunday rounding up the selection issues among the heavyweight men’s squad. Perhaps the only hard news story of the day was Alan Campbell’s revelation, in an interview for West London Sport that he is taking part in trials for the double scull, and could move from the single if successful. Alan also talked about his “spiritual home”, Tideway Scullers School in Chiswick, for a piece that will help launch WLS’s video offering (and marked my first shoot-edit project). I also popped over to Reading Rowing Club, where Sir Matthew Pinsent was helping to launch the Nation on Trial scheme, encouraging members of the public to record their time for 2,000m on a rowing machine, and raise money for charity in a scheme that builds on the Siemens-sponsored Stroke for Stroke initiative of previous years. 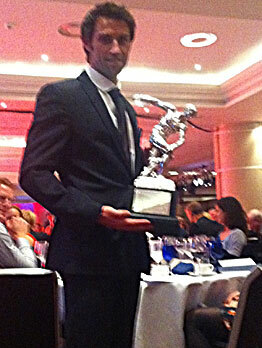 A busy rowing weekend also included Saturday’s Quintin Head, which provided the race footage in the Campbell video, and that evening’s GB Rowing Team dinner at Twickenham, where Mark Hunter – world champion in the lightweight double scull – was named rowing’s Olympic athlete of the year, and earned a rather large trophy. Most other Olympic sports named their athlete of 2011 in December but rowing always waits until its annual shindig.